In the late 80's I had the opportunity to photograph a series of paintings done by Arlie Gentry. If you have ever been inside the meeting chambers of City Hall, you will see one of the many composite paintings behind the heads of the Unified Government members. Arlie painted Wyandotte County with a mixture of historical beauty and ethnic culture while blending in the beauty of open sky and modern architecture. She had a vision of Wyandotte County that soared far above the minds of the average. I, for what ever reason, could see her vision. 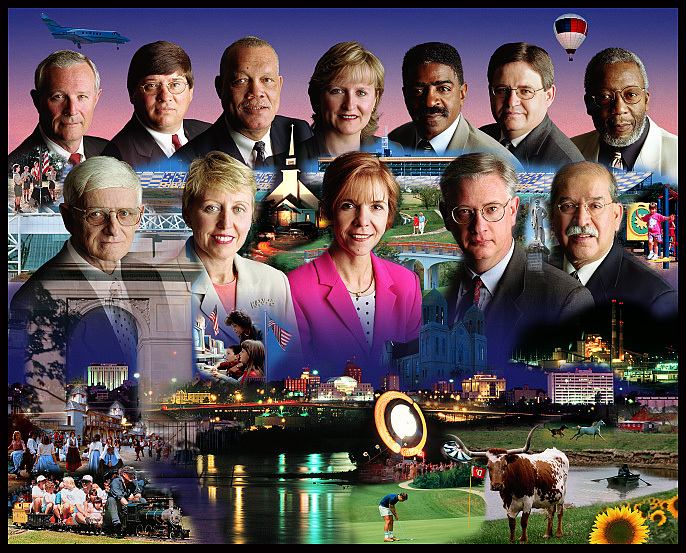 This photograph of the Wyandotte County Unified Government was inspired in my mind many years ago by Arlie. It wasn't until the late 90's that technology afforded me the necessary tools to create in photographic medium what Arlie Gentry could do with a brush. Thank you, Arlie, for passing on your vision of a county blessed with open grandeur, yet woven together with the conveniences of a metropolis. Wyandotte County is truly the place to be --- to live and grow.